Note from shop owner Many thanks for visiting my shop! I am on holidays and my shop will reopen shortly - please come back and visit. Many thanks for visiting my shop! I love this card holder. Very cute little purse, love it, thank you! First set of MOO card holders ready to be shipped. These make great business card holders, gift card holders, ID transit card holders or mini purses with a key ring included. Fun and functional with many designs available. 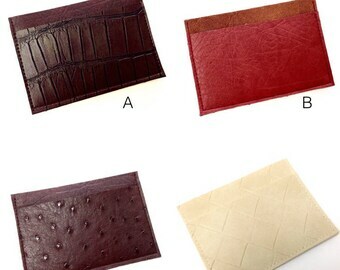 Additional slim wallets available in my shop just in time for gift giving. Can be used as gift card holder, transit pass, ID, credit card holder, bills.. makes a great stocking stuffer. Been squirreling away working on an order featuring a bouquet of floral fabrics. I have always loved the arts right from when I was small. I loved drawing and making crafts - whether it be with fabric or knitting or crocheting. I loved learning new craft. I’ve had my sewing machine for over 30 years (it was a present from my Dad). It’s my pride and joy and it’s still a work horse, even if it needs encouragement sometimes (like the rest of us when we get a bit older!). My mom taught me to sew when I was 7 or 8. I used to make doll clothes all the time and pretend that I was a fashion designer. Since then I’ve been self-taught and I graduated to making clothes for myself in high school because I wasn’t into mainstream clothing. I just kept trying until things came out the way I wanted them. I love the creative process - designing and making something from nothing or creating something using the most unconventional items. I hate waste, so I try to repurpose materials or try and use what I have around. It’s hard to describe my creative process because it’s spontaneous. I see a fabric and in my mind I picture what I would like to turn it into. It’s very much a trial and error process where I’ll make my item and then tweak it until I feel that it’s right. I am always happy to consider requests for custom and wholesale orders. I am now accepting custom orders for wristlets or clutches for brides and bridal parties. These can be matched sets, mixed sets, individual pieces or anything else that will help make your wedding special. I will work with you to find a fabric in your wedding colors if I don't have something you like in stock. Custom monogramming is also available. Please convo me for details of availability of fabric and additional cost. Custom orders are usually completed on a first-come, first-served basis. In most cases please allow at least one month after placing your order for me to make the items and and for them to be delivered to an address in the US or Canada. Allow extra time for larger orders, for orders shipped outside North America or if I have to special-order fabric that I don’t have in stock. Please contact me for more information. I am always happy to answer questions and to provide a price quote and estimated delivery date. Please contact me if you are not satisfied for any reason. Refunds on regular orders will only be given provided the items are returned in their original good condition at the buyer's expense (shipping fees will not be reimbursed). Please note that I cannot accept returns on custom orders. All purchases of custom orders are final. Purchases of stock items from my shop: payment must be received within 2 days or the order will be cancelled. CUSTOM ORDERS - payment must be received in full and cleared before work is to be started. *All sales are final on custom orders*. Please note that Etsy lists all prices in US dollars. If you want to estimate the price in another currency then Universal Currency Converter ( http://www.xe.com/ucc/ ) is a helpful site. For Canadian buyers I am happy to bill you via a PayPal invoice in Canadian dollars upon request. Orders shipped to Canadian addresses are subject to HST/GST (rate depending on the province; HST/GST # 857560098 RT0001). The amount of tax will be shown in the paypal invoice before a sale is completed. Items will normally be shipped within 3 business days of payment unless otherwise noted in the item listing. However, if the address provided with your Etsy order does not match the address provided with your Paypal payment I may delay shipping until I can confirm the correct address. Packages will be shipped using Canada Post small packet or parcel services. If you wish to use an upgraded service (e.g. for faster delivery) or a courier service please contact me for a quote. I ship packages worldwide, but please note that the recipient of the package is responsible for all customs fees, brokers fees and similar charges. These fees and charges are NOT included in either the purchase price or the shipping costs. Please contact me on pricing on wholesale orders. I am presently not accepting consignments.